Stamped with a “S925” marking to indicate its purity. Zircon is well known as a substitute for diamond due to its high hardness and great fire. Cubic zirconias are well paved to avoid loosings. 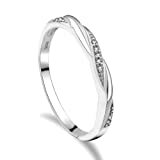 This ring is stamped with a “S925” marking, has an vintage Style look and would make for a lovely gift. 925 silver will not bleed or shed onto your skin when you wear it.